Did we dig the dough at Baz and Fred? Here's how the night went down. Last updated 31 August 2017 . By Tom Pears. The casual and cool team behind Baz and Fred. I didn’t think I would be blown away by a pizza joint in London, not that I have any deep internal hatred of pizzas. But past experiences have always left me pining for the ones I gleefully devoured in Italy. However, I can say with absolute certainty that Baz and Fred is the best pizza I have had in London and they've made me fall in love with the style all over again. Baz and Fred is situated in the heart of Flat Iron square, which is about a five minute walk from Borough tube station. The first thing you’ll notice about Baz and Fred are the two rows of flying saucer shaped ovens behind the chefs. These compact little silver things are extremely powerful and will cook your pizza to crisp, but fluffy perfection in under 4 minutes. Which means, the service is extremely efficient and perfect for a lunchtime pizza or evening nibble with friends. The menu ranges from the basic Marinara to super spicy Nduja and Chorizo pizzas. We decided to plump for one spicy and one non spicy pizza for diversity. The Napoli Salami pizza was gorgeous, there was a generous dosage of chilli but in no way was it too overpowering or taste-bud-numbing. We also chose the Parma Ham, Portobello Mushroom and Mozzarella pizza. I often find pizzas to be a little bit too cheesy and as a result quite heavy. These two however were both light and tasty. In particular, the parma ham worked wonderfully in tandem with the big juicy mushrooms. For me, the most impressive factor about the pizzas was how fluffy they were without being heavy. We polished off both pizzas with ease plus every ounce of the amazing homemade garlic dip (which I am still seriously salivating over). 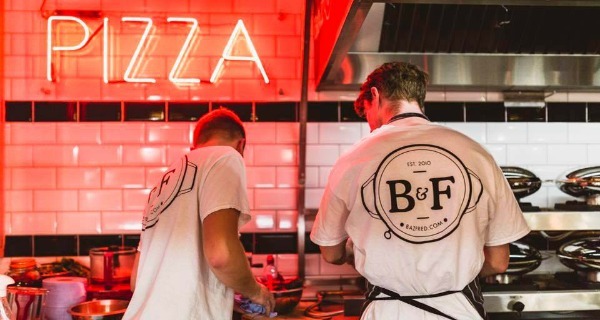 If you’re a pizza lover, pining for a holiday in Italy (like me) or just want an informal meal out, then I’d recommend Baz and Fred. Great pizza, top notch staff and reasonably priced (all pizzas are under £10). In a word; bellissimo.